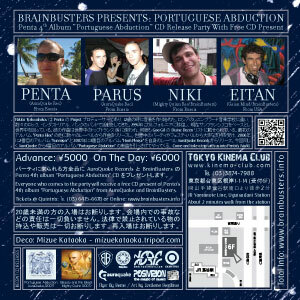 Everyone who comes to the party will receive a free CD present of Penta's 4th album “Portuguese Abduction” from AuraQuake and BrainBusters. Nikita Tselovalnikov は Penta の Project プロデューサーであり、12歳の時に音楽を作り始めた。ロシアのレニングラード音楽学校に通い、数々のロック、インダストリアル、パンクのバンドで活動をしてきた。1991年にカルフォルニアに移住し、現在サンフランシスコをベースとし世界中を回っている。彼の作曲は世界中のトップトランス DJ に使われ、何度も Goa Gil の Divine Dozen リストに載せられている。最初のアルバム "Penta Files" の他に数々のレーベルから作曲をリリースし、世界中のパーティやフェスティバルから大きな支持を受け、2006年に2番目のアルバム "Funraiser" と 2007年に3番目のアルバム "Horn Please" を自身のレーベル AuraQuake Records からリリース。今回同じく AuraQuake から4番目のアルバム "Portuguese Abduction" の新曲を引っさげてやってくる。 Come and have Penta for Breakfast. JR Yamanote Line, Uguisudani Stn. ~2 mins walk. Those under 20 are not admitted to the event. Photo ID required. No Exceptions. 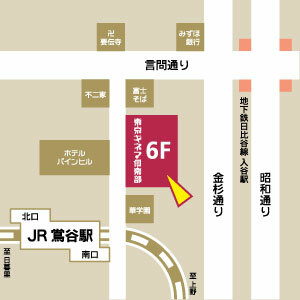 It is strictly prohibited to use any recording devices (tape recorders, cameras, video, etc...) No alcohol, hazardous materials, drugs or other materials prohibited by law is allowed into the venue. We will assume no responsibility for incidents, accident, theft, loss, tow-away, locker or clerk, lost or stolen or damaged item, ... In case the event is cancelled due to a natural disaster (ex: Earthquake, typhoon, volcanic eruption, etc) or acts of war, tickets will not be refunded. Parties involved in actions such as fights, acts of violence, interference of the event, or those causing trouble to other participants, and those who don't follow the staffs' instruction will be forced to leave. We reserve the right to refuse entrance. Do not park illegally, use appropriate parking place for cars, etc. Please be responsible, no attitude and respect the other people. Keep the streets clean, do not throw away the flyer. Guest with invitation tickets only. The information on this flyer might change, regularly check our website.